The Reclaimer, our lowest production finger jointer, offers the customer a way to recover their minimal amount of trim ends. Operating at either 30 to 60 pieces per minute, this system will give you the versatility you want and comes standard with our highly reliable rapid stop & cut assembly section, so the quality and structural integrity has not been compromised. Two (2) 7.5HP trim saws, with carbide tipped saw blades. Electric fixed speed chain operates at 60 feet per minute. Lugs come standard on 24" centers, with an option to go to 12". Fixed speed live roll crossover. Manual corner transfer (optional automatic corner transfer. 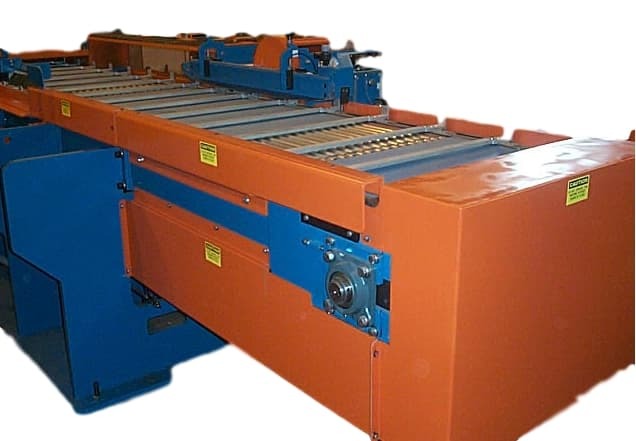 Hydraulic Powered Board Press, comes standard at 8', with an option to go up to 40' lengths. One fully assembled, tested and operational three phase Motor Control Center (MCC) with Programmable Logic Controller (PLC). Machines are built to your specified voltage, and costs may vary.